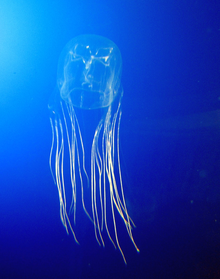 Box jellyfish (class Cubozoa) are cnidarian invertebrates distinguished by their cube-shaped medusae. Some species of box jellyfish produce extremely potent venom: Chironex fleckeri, Carukia barnesi and Malo kingi. Stings from these and a few other species in the class are extremely painful and can be fatal to humans. The box jellyfish is the most venomous creature known to mankind. They found in Indo-Pacific region. There have been hundreds of reported fatal attack on humans every year. The cubic shaped jelly fishes have 15 tentacles on each side of their body. These tentacles can reach up to a length of 10 feet. The lengthy tentacles also contain more than 5000 stinging cells. The venom of box jellyfishes will affect the nervous system and the heart. The human victims are likely to die before reaching the shore. King cobra (Ophiophagus hannah) is an elapid found predominantly in forests from India through Southeast Asia. This species is the world's longest venomous snake, with a length up to 18.5 to 18.8 ft (5.6 to 5.7 m). It preys chiefly on other snakes and occasionally on some other vertebrates, such as lizards and rodents. The king cobra is a dangerous snake that has a fearsome reputation in its range, although it typically avoids confrontation with humans when possible. King Cobra is the longest poisonous snake in the world. They inject high amount of nuetrotoxin on a single bite. It is powerful enough to kill an African elephant within a few hours. Unlike other poisonous snakes the king cobras inject 5 times more amount of venom in a single bite. 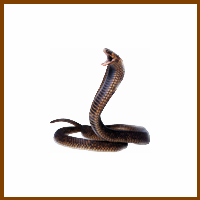 The bite from king cobras are extremely painful and the venom will spread rapidly. That amount of venom can kill up to 20 grown men. Conus marmoreus, common name the "marbled cone", is a species of predatory sea snail, a marine gastropod mollusk in the family Conidae, the cone snails, cone shells or cones. It is the type species for the Conus genus. This is a species which is believed to feed mostly on marine molluscs including other cone snails. This snail is venomous, like all cone snails. found mainly in Indian ocean. One drop of venom from marble cone snail has enough power to kill up to 20 adult humans. They mainly use their deadly venom to catch the prey. Unfortunately, there is no anti-venom for the bite of marble cone snail. The sting from marble cone snails normally occur when the snorkelers and swimmers handle them carelessly. The venom can cause loss of coordination, difficulty in breathing, heart failure and double vision. The serious cases even lead to coma and death. Synanceia is a genus of fish of the family Synanceiidae, the stonefishes, whose members are venomous, dangerous, and even fatal to humans. It is one of the most venomous fish known. They are found in the coastal regions of the Indo-Pacific. They lurk in mud or sand on ocean floors and very difficult to find them. The deadly stone fish contains 13 sharp poisonous dorsal spines. They also sting very quickly. The sting from stone fish cause extreme pain, swelling, muscle weakness and temporary paralysis. The chances of death are higher without proper treatment. Stonefish stings can occur on the beach, not just in the water, with stonefish being able to stay out of the water for up to 24 hours. They often cannot be easily seen as they look similar to rocks or coral. The deathstalker (Leiurus quinquestriatus) is a species of scorpion, a member of the Buthidae family. To eliminate confusion, especially important with potentially dangerous species, the scientific name is normally used to refer to them. The death stalker scorpions have the deadliest venom than any other species of scorpions. They are very aggressive type of scorpions inhabit in deserts and scrublands across Middle East and North Africa. The neotrotoxin venom present in death stalker scorpions can be deadly to humans. The bite from a death stalker scorpion is extremely painful and can cause heart issues. Once bitten by death stalker scorpion you need to seek medical attention immediately. The delay for proper treatment can cause severe problems and even death. Inland taipan (Oxyuranus microlepidotus) also commonly known as the western taipan, the small-scaled snake, or the fierce snake, is an extremely venomous snake of the taipan genus, and is endemic to semi-arid regions of central east Australia. The inland taipan is considered the most venomous snake in the world; It is estimated that one bite possesses enough lethality to kill at least 100 full grown men, and, depending on the nature of the bite, it has the potential to kill someone in as little as 30 to 45 minutes if left untreated. It is an extremely fast and agile snake that can strike instantly with extreme accuracy, often striking multiple times in the same attack, and it envenoms in almost every case. The inland taipan is usually quite a shy and reclusive snake, with a placid disposition and prefers to escape from trouble. However it lives in such remote locations, the inland taipan seldom comes in contact with people; therefore it is not considered the most deadly snake in the world overall, especially in terms of disposition and human deaths per year. Phoneutria, commonly known as Brazilian wandering spiders, armed spiders (armadeiras) are a genus of aggressive and venomous spiders of potential medical significance to humans. They are mainly found in tropical South America, with one species in Central America. The Brazilian wandering spiders appear in Guinness World Records from 2010 as the world's most venomous spider. Their venom contains a potent neurotoxin, known as PhTx3, which acts as a broad-spectrum calcium channel blocker that inhibits glutamate release. At deadly concentrations, this neurotoxin causes loss of muscle control and breathing problems, resulting in paralysis and eventual asphyxiation. In addition, the venom causes intense pain and inflammation following a bite due to an excitatory effect the venom has on the serotonin The Brazilian wandering spider's prey also includes crickets, katydids, mantids, and other larger animals, including tree frogs and lizards. Poison dart frog is the common name of a group of frogs in the family Dendrobatidae which are native to tropical Central and South America. These species are diurnal and often have brightly colored bodies. This bright coloration is correlated with the toxicity of the brightly colored species, making these species aposematic. Some species of the Dendrobatidae family exhibit extremely bright coloration along with high toxicity, while others have cryptic coloration with minimal to no amount of observed toxicity. The species that have great toxicity, derive this from their diet of ants, mites and termites here are 100 different types of poison dart frogs are in the world, varies by color and pattern. Golden poison dart frogs are most dangerous among them. One golden poison dart frog contain enough venom to kill up to 10 adult men.